In November, the number of minutes watched on our offTheLeftEye YouTube channel hit a new milestone—two million minutes, or 3 years and 299 days, watched in the space of a single month. That figure has doubled since June, when the channel crossed the million-minute-per-month mark. 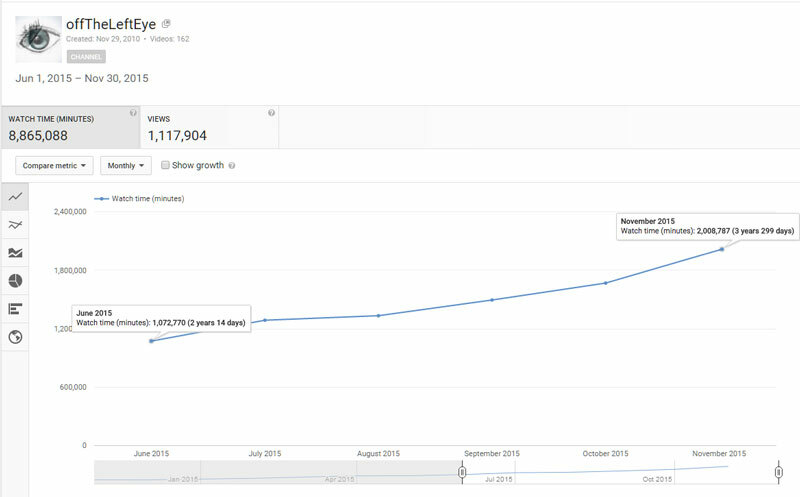 The explosive growth of the channel is due to YouTube’s recommendation algorithms. When a person watches a video on the channel, YouTube automatically suggests a similar video to watch, and as our catalog of videos grows, the number of videos being recommended to new viewers also expands. The same month, the channel also set a record for the number of views (that is, the number of times a visitor watched one of the videos on the channel) at just under 234,000. YouTube doesn’t provide data on how many individuals are represented by those minutes, but every month we’ve set records for the number of new subscribers, so the audience is clearly expanding. Many thanks to all the fans and supporters of the show who make this possible!